Chapters 1 to 5 provided you with information on the background related to encryption. 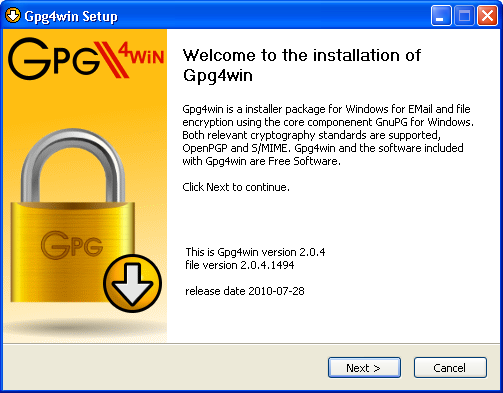 While Gpg4win also works if you do not understand the logic behind it, it is also different from other programs in that you are entrusting your secret correspondence to this program. Therefore it is good to know how it works. 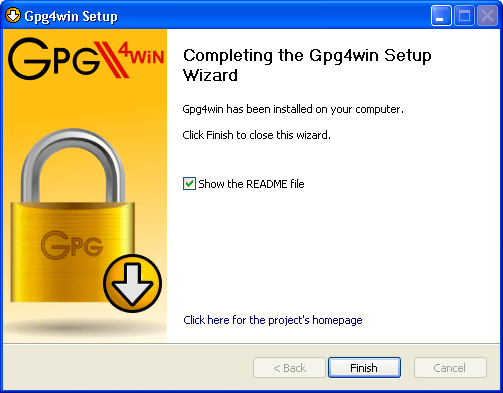 With this knowledge you are now ready to install Gpg4win and set up your key pair. If you already have a GnuPG-based application installed on your computer (e.g. GnuPP, GnuPT, WinPT or GnuPG Basics), please refer to the Annex 25.4 for information on transferring your existing certificates. You can load and install Gpg4win from the Internet or a CD. To do this, you will need administrator rights to your Windows operating system. gpg4win-2.0.0.exe (or higher version number). 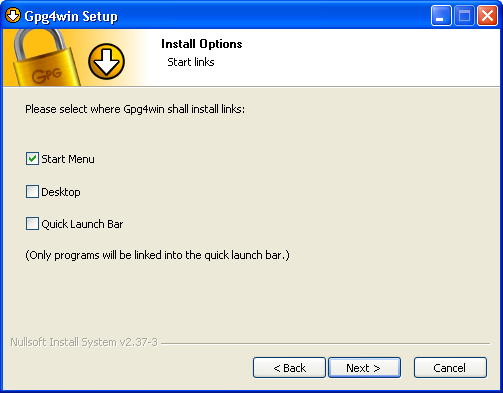 If you received Gpg4win on a CD ROM, please open it and click on the "Gpg4win" installation icon. All other installation steps are the same. The response to the question of whether you want to install the program is [Yes]. 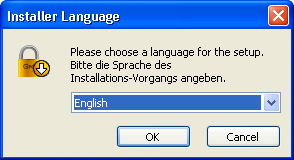 Confirm your language selection with [OK]. Close all programs that are running on your computer and click on [Next]. 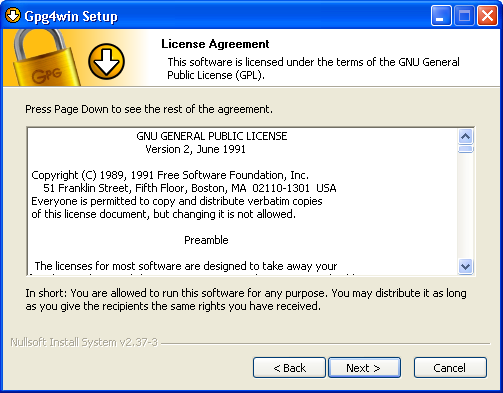 The next page displays the licensing agreement - it is only important if you wish to modify or forward Gpg4win. If you only want to use the software, you can do this right away - without reading the license. 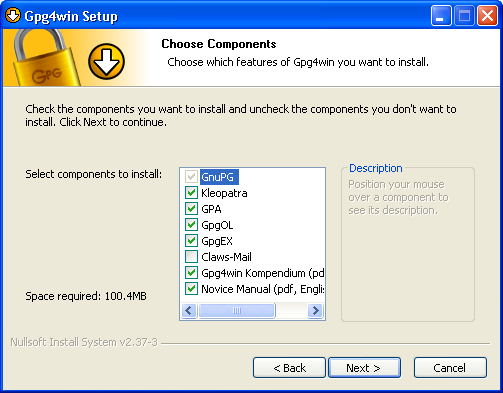 On the page that contains the selection of components you can decide which programs you want to install. A default selection has already been made for you. Yo can also insall individual components at a later time. Moving your mouse cursor over a component will display a brief description. Another useful feature is the display of required hard drive space for all selected components. 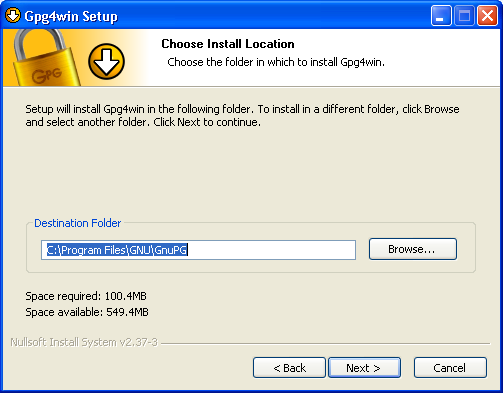 You can accept the suggestion or select a different folder for installing Gpg4win. Now you can decide which links should be insalled - the system will automatically create a link with the start menu. You can change this link later on using the Windows dashboard settings. If you have selected the default setting - link with start menu - you can define the name of this start menu on the next page or simply accept the name. During the installation process that follows, you will see a progress bar and information on which file is currently being installed. You can press [Show details] at any time to show the installation log. Once you have completed the installation, please click on [Next]. You have the option of displaying the README file, which contains important information on the Gpg4win version you have just installed. If you do not wish to view this file, deactivate this option. Now you can decide whether Windows should be restarted immediately or manually at a later time. 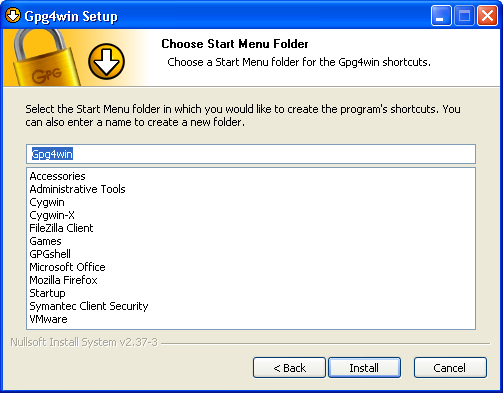 You have successfully installed Gpg4win and are ready to work with the program. For information on automatically installing Gpg4win, as may be of interest for software distribution systems, please see the Annex 25.4 "Automatic installation of Gpg4win".